Gutter clogs are a disaster waiting to happen. If your gutters are obstructed, all it takes is one rainstorm to ruin your property. You can easily end up with a flooded basement or crawl space. When your gutter system is clogged it needs to be immediately addressed. Your gutters help keep water and moisture away from your foundation and out of your home and basement. 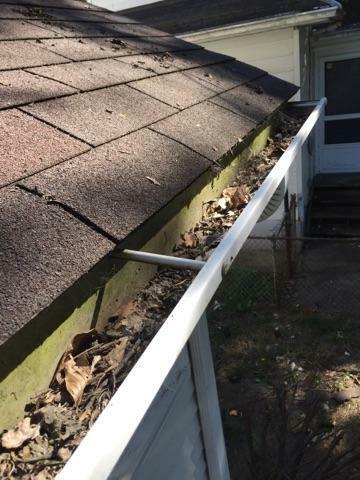 When gutters are ignored and go without cleaning, a wide range of dirt and debris may end up in them – just look at the list in the sidebar at right. Cleaning your gutters can be a tiresome and risky job, but we have a solution. Bone Dry Roofing specializes in gutter protection and offers quality, custom gutter guard systems that can fit any home. Call us or contact us online for a Free Estimate! We service Cincinnati, Dayton, Hamilton and nearby. Cleaning your gutters must be done. If you are going to attempt this yourself, it's important to be aware of the following hazards. Injury from falling off the ladder or roof. Infection and health issues from mold and bacteria. Accidentally damaging your gutters with tools and ladders. Soiling or damaging your siding and landscaping with falling debris. As long as your gutter system remains unprotected from sediment, plant matter, and debris, you will always have to clean out your gutters. It's time to end the cycle of cleaning your gutters! Bone Dry Roofing can replace your old gutter system with our quality gutter guard system, proven to protect your gutters for life. By adding protection over the top of your gutters, we eliminate the time and hassle of cleaning your gutters yourself or the cost of having to pay someone to do it for you. To learn more about Bone Dry Roofing's expert gutter services, call Bone Dry Roofing today or contact us online for a free estimate. Our gutter services are offered in Hamilton, Dayton, Cincinnati, Middletown, Fairfield, Loveland, Ft Mitchell, Mason, Miamisburg, West Chester and nearby. These gutters were full of leaves and debris. Our repairman removed all of the leaves and debris so the gutters can flow properly. Give us a call if your gutters are loaded! Neglecting your gutters will only cost you in the long run. Water will back up and get under the shingles of the roof. This will cause massive wood rot damage to the decking, and can even hurt the rest of the house. Sometimes reaching your gutters to clean them just isn't an option for homeowners. That's why Bone Dry Roofing offers gutter cleaning services! Call us today! The gutters on this home were full of leaves and debris. It can be difficult for some homeowners to get to their gutters to provide maintenance. If the gutters weren't cleaned, there could be serious roof leaks. Our repairman removed all of the leaves and debris to allow the gutters to work properly. The gutters on this home in Middletown were full of leaves. Having full gutters can cause water to back up allowing it to get inside the home. The homeowners called Bone Dry to come clean the gutters for them. It was time to clean these gutters on this home. They were full of leaves and debris. Our repairman removed all of the leaves and debris out of the gutters to allow water to flow through them properly.